Move-in-ready, this home is as beautiful inside as out and looks brand new! It offers three bedrooms, large open spaces, unusual architectural details, and light-filled rooms that flow easily from one to another. The massive stone fireplace dominates the living room, with a vaulted ceiling and French doors that open to the deck and back yard. The kitchen features cherry cabinets & granite counters, and the entire first floor is done in hardwood. The master suite opens into a private enclosed porch, and the master bath includes a large soaking tub, separate shower, double sinks and a walk-in closet. Upstairs you'll find two large sunny bedrooms, another room that could be an office, and a full bath. The large basement has a woodstove and provides lots of storage space, there is an attached garage, and wraparound decks are where the summers will be spent. This is a lovely home on a beautiful, private two-acre lot. The location would be perfect for anyone commuting to Rochester, the Seacoast, or points south; Old Wolfeboro Road runs parallel to Route 28 and provides privacy and a country feeling while still allowing for easy access to main routes. Wolfeboro and Lake Winnipesaukee are just a few minutes to the north. 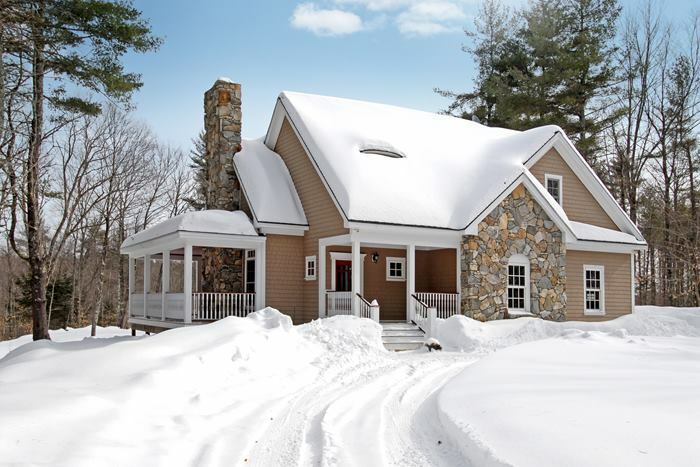 Looking to buy in the Lakes Region? Come visit us tomorrow or visit our website. The snow is melting and spring is right around the corner!